Haji Noor Deen is an internationally acclaimed Master calligrapher who creates graceful works of art that are stunning and inspirational. Haji Noor is the first Chinese Muslim to be conferred Certification of Arabic Calligraphy in Egypt and Certification by Master Calligrapher Hasan Celebi in Turkey. 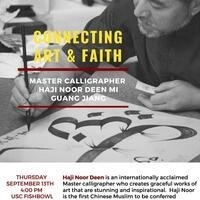 He will demonstrate how he uniquely fuses Arabic and Chinese script into the Sini style of Islamic Calligraphy.